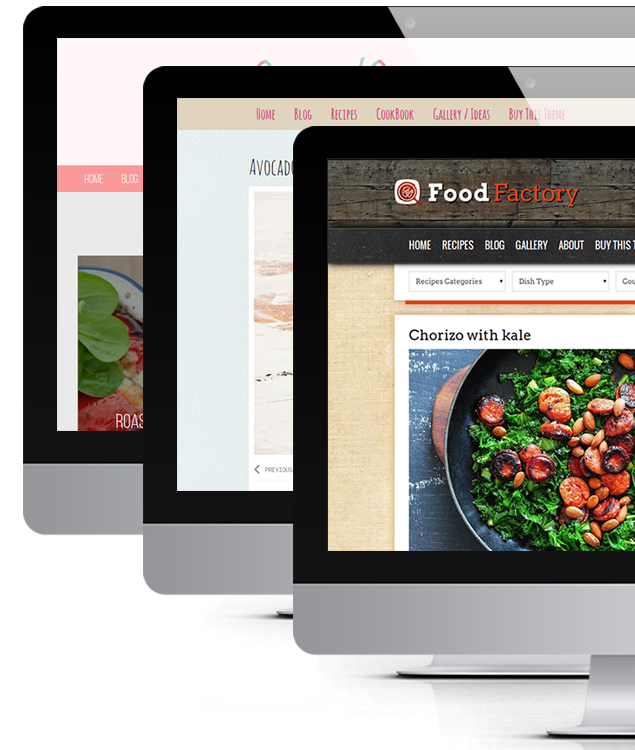 Looking best food WordPress themes? Don’t look any further – the Salt & Pepper has arrived. We are happy to introduce the Salt and Pepper – a truly premium food recipes WordPress theme designed for food bloggers, food recipe websites, hobbyst cooks, chefs & cooking related websites in general. It embraces a clean and uncluttered design whilst providing many useful features every professional food blogger may need. We highly recommend it to those of you, who are looking for an alternative solution to the Food Factory theme or CookBook theme. Please take a moment to read more about features that come with this ultimate food recipes WordPress theme. The theme has been optimised for mobiles, tablets and desktop screens. The Salt & Pepper comes with 5 unique, contemporary designs for food recipe custom posts. 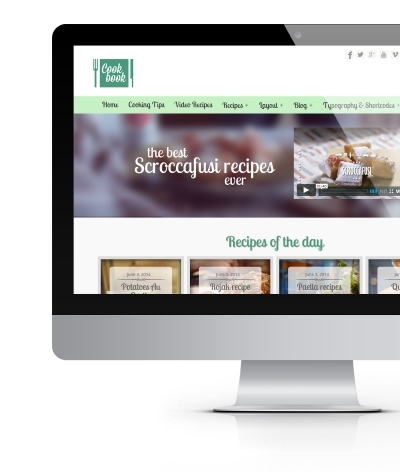 Take a look at the demo and browser the recipe posts to see how it looks like in real life. Although the theme comes with preset color scheme as it is presented on demo website, you can choose whatever colors you like. Set background colors using color picker or upload your own images that will server as a background. The same rule applies to text color, navigation color, in content link colors, hover link color. You can use color picker to choose the color you like. Of course you can insert color html code if you prefer. Upload your own Logo & Favicon via Theme Options panel. You can also set text version logo. Then your site name will show up as a logo. This beautiful theme comes with sticky navigation (header) bar. The option can be turned on / off in the Theme Options panel. So when user scrolls down the page the header remains always at the top letting user to browser your website easily. 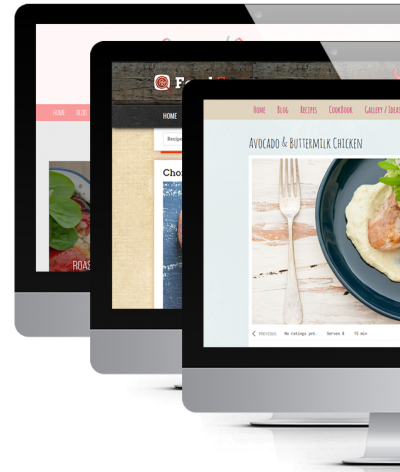 Unlike many foodie WordPress themes the Salt & Pepper uses custom posts to store recipes in your site. This is very beneficial as your recipes will not be duplicated on 3rd party sites without your permission, only because you are using recipe card plugin for your site. It normally happens when recipes are published via plugin. Those plugins automatically populate your recipes on other sites taking advantage of your carefully created content or precious unique recipes. Recipes are added via Recipes > Add New from admin dashboard. Plain an easy. Users can share recipes and posts thanks to sharing options built in the theme. Additionally the Salt & Pepper WP theme comes with custom social media widgets: Facebook Fan Page, Instagram, Flickr and Social Networks. The Social Networks widget shows links with icons to social media profiles: Facebook, StumbleUpon, Instagram, Pinterest, Twitter, Bloglovin, Flickr, Youtube, Email. Select the font you like. You don’t need to stick with the fonts we have chosen for live demo site as the Salt & Pepper theme comes with hundreds custom fonts (Google Fonts) that can be used to build your site. You can stick with our typography settings but if you prefer to use any other fonts you can easily change them via Theme Options panel where you can specify fonts separately for navigation bar, body text, each type of heading (h1,h2… h6). 300+ icons at your service. You can use social media icons that come with Font Awesome to spice up your blog posts, pages and widgets. You can also use icon shortcode to insert graphics based icons, so you are not limited to font awesome only. Adding new elements to posts, pages (and widgets) made easy. You can choose from over 90 shortcodes available via shortcode button. You can add carousels, posts grids, post cycle, 2 types of carousel sliders, buttons, different list styles (10+), columns, hero unit and more. Many of the shortcodes have additional options that let you optimize the way the element will look like. This creates almost endless possibilities for building truly unique website or blog. You can have full width blog, blog with right sidebar and blog with sidebar on the left. Set the layout option you prefer. Build your own foodie shop. The theme currently supports WooCommerce plugin. The advanced integration and custom styling will be coming soon with the next update. Naturally even if you don’t plan to set up your food store you can use the eCommerce functionality to monetize your food blog. You can list the products you like and add affiliate links to your favourite food products, i.e. organic food, paleo, vegetarian etc. There are many possibilities, you can link to Amazon for example or shops offering kitchenware and homeware that have affiliate programs. Note: Slider design & images are not included. Meta Slider basic comes with the theme, for the ‘layer’ slider you can upgrade to Meta Slider Pro with Matcha Labs that gives you support for videos, layers and many more options. Our demo uses layered slider which is totally optional and you will need to purchase Meta Slider Pro license from Matcha Labs. Not sure yet? 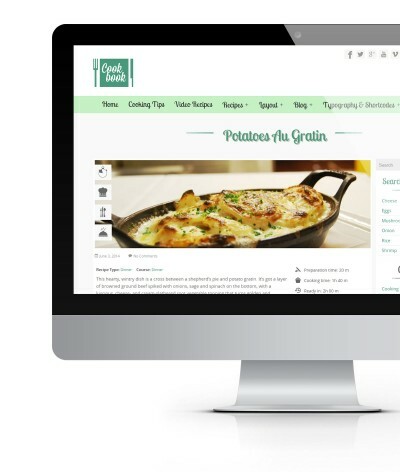 Why don’t you check out our live demo site for the Salt & Pepper Food Recipes WordPress theme. 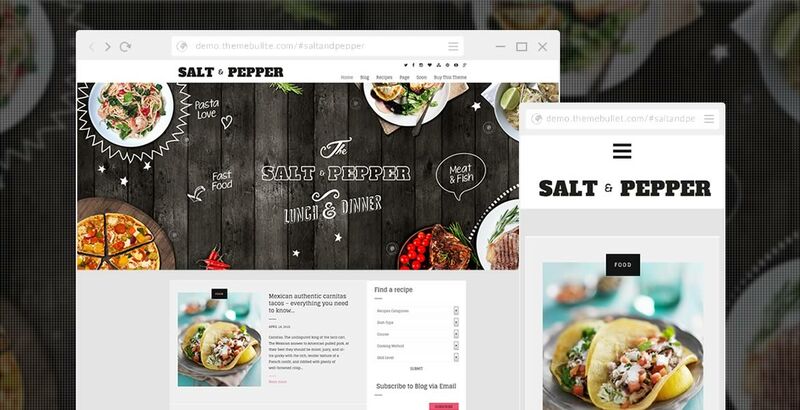 Salt & Pepper is a perfect theme for: food blogs, chefs, cooking related websites, online cookbooks, occasional fod bloggers, food magazines and foodies in general. Slider design and images are not included.